Last weekend we drove through to St Andrews, which is a hop and a skip away from Dundee. We were visiting a restaurant, one we hadn't tried before. 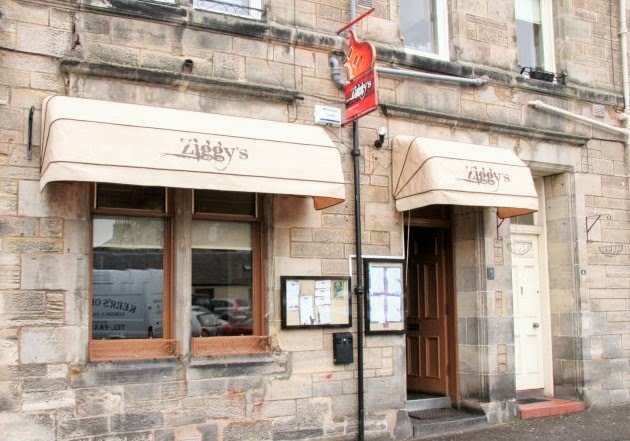 We often drive to St Andrews for a meal. It's only about 20 minutes from Dundee and there's much more choice. It's a great place to shop too with lots of interesting wee independent shops, which are perfect if you are looking for gifts. It's also a nice place for a stroll on a sunny day. It has some gorgeous architecture and lots of cobbled streets. 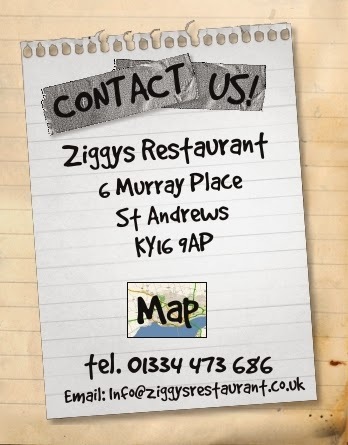 The restaurant is called Ziggy's and it's down a side street just before the cinema. 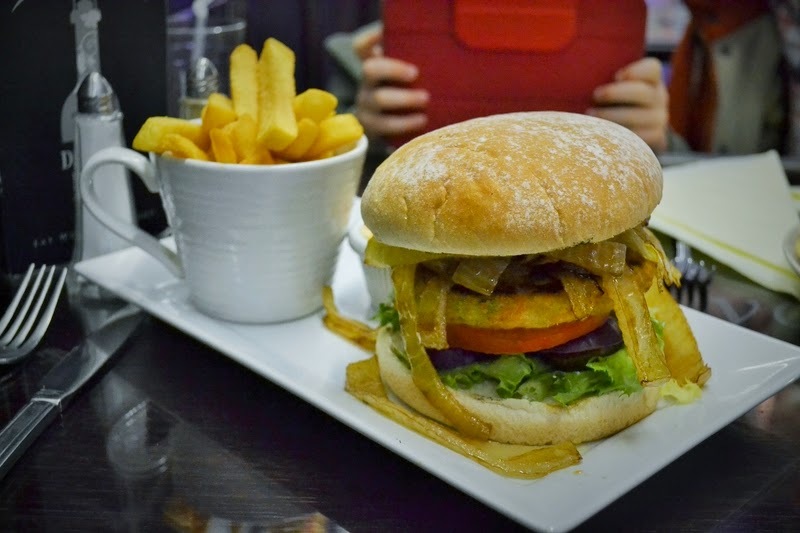 The menu features homemade burgers, Mexican dishes and steaks. 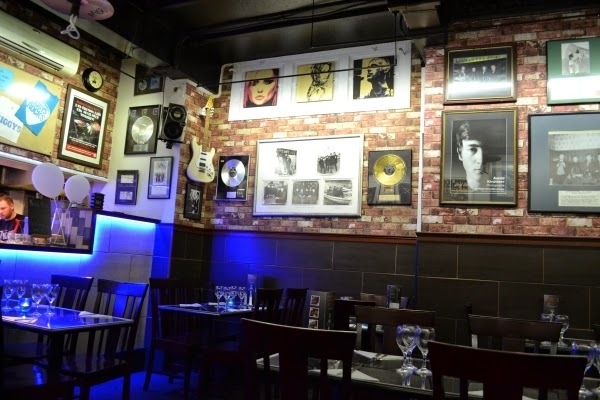 The restaurant has a rock theme with lots of memorabilia and guitars on the walls, blue neon lighting and rock music playing. Cooper started with some garlic bread and then moved on to macaroni cheese. Graham started with a mixed salad and then had vegetable fajitas with guacamole and salsa (hold the cheese and sour cream for this vegan boy!). 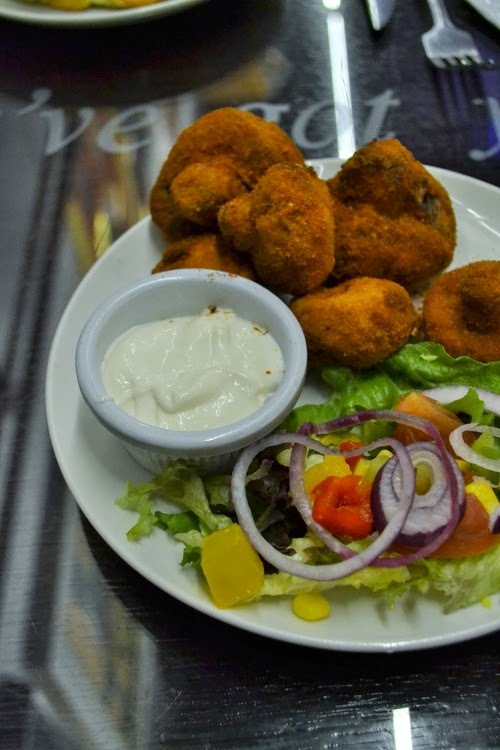 I started with Cajun Shroomies (Cajun breaded mushrooms) with garlic mayo and then had a veggie burger with fried onion, slaw and fries. Oh yes! Well for Cooper and I anyway. There was nothing suitable for vegans. 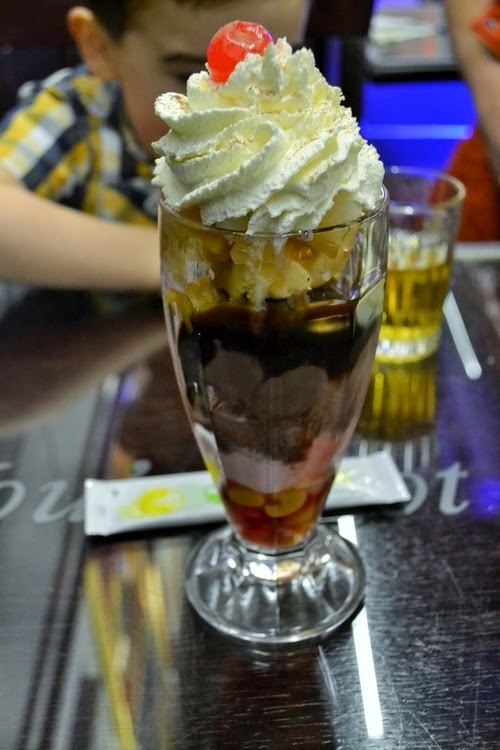 Cooper had chocolate ice cream and I had a knickerbocker glory. We liked the restaurant, it was cozy to relax in and the staff couldn't be nicer. Cooper enjoyed his meal, although he is going through a lean period at the moment and eating like a mouse, so he needed lots of encouragement. Graham enjoyed his salad (which had a balsamic dressing) and his fajitas. He could possibly have done with another tortilla wrap to finish his sizzling vegetables though. Yes, but maybe not the veggie burger. It was well priced. £3.15 for Graham's mixed salad and £4.95 for the mushrooms. My burger was £7.75 with the onions added and Graham's Fajitas were £11.45. 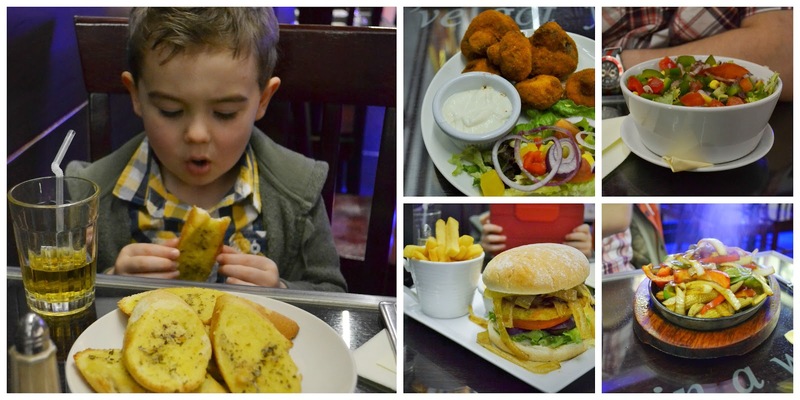 Cooper ate from the kids menu which was £4.75 for a meal, drink and ice cream. I want to bury my face in that lush looking burger. The prices seem like really good value too. Yes it was great value and a great wee restaurant. I'd be interested to go back and try some of their Mexican food. That picture of Cooper and his gigantic plate of garlic bread is adorable! I know it was huge! I thought maybe two or three pieces would arrive at the table. It's huge isn't it. A huge range of toppings to add too, if you wanted too. Sounds and looks good Jac. Hopefully when the V&A finally opens there will be more choice in Dundee. I'm hoping so Janice, but that could be a few years away now. It's been delayed again. Sounds great Jac - pity about the burger though. Must try the place out. It's certainly close enough for us to go to Stuart which is a plus!